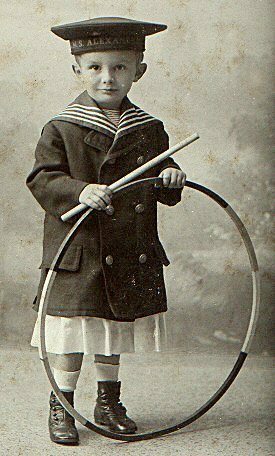 The earliest known incidence of hooping was in ancient Egypt as early as 1000 BC, where children used large hoops made of grape vines, which they rolled along the ground propelled by sticks, or swung around their waists a la the modern hoop. In other parts of the ancient world, hoops were made of stiff grasses as opposed to vine. In the 14th century, recreational hooping swept across England. The records of doctors at the time attribute numerous dislocated backs and heart attacks to “hooping.” The word “hula” became associated with the toy in the early 19th century when British sailors visited the Hawaiian Islands and noted the similarity between “hooping” and traditional hula dancing. Independently, Native Americans developed their own traditions surrounding the Hoop Dance. 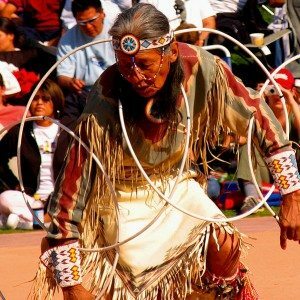 Native American Hoop Dance focuses on very rapid moves, and the construction of hoop formations around and about the body. Up to 30 hoops may be used in storytelling rituals to create formations such as the butterfly, the eagle, the snake, and the coyote. Native American hoops are typically of very small diameter (1 to 2.5 feet). In 1957, an Australian company began manufacturing bamboo hoops for sale in retail stores. This caught the attention of a new California-based toy company by the name of Wham-O, founded by Richard P. Knerr and Arthur K. Melin. In 1958, Knerr and Melin travelled to playgrounds across Southern California, where they gave away free hula hoops and performed hooping demonstrations for the children. From this humble beginning, over 25 million hula hoops were sold in a four-month period.